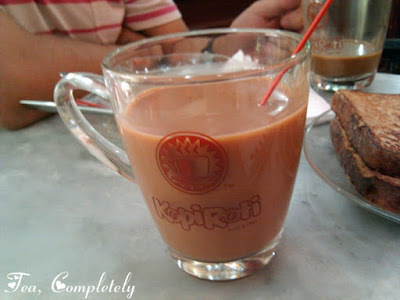 I usually order iced tea with milk at Kopi Roti, but since my tonsils were taking awhile to get well I decided to try out hot milk tea. I was quite nervous at first since I didn't know if I'd like it. I was hooked at the first sip though and now I'm not sure which I like better. Maybe I'll order both next time I visit Kopi Roti. LOL. Hi Tea bloggers : Aileen & Andrew! It's my first time to have read blogs all about tea, and it fascinates me, as i am tea drinker as well. Since i also love trying different types of tea as well as food, i always go places finding the right tea for me. And i had found the one close to and in between quickly's taro milk tea and that of Zagu, and that is Tea Zone, located in (G/F)Victory Central Mall-Caloocan City, and several branches spread in metro manila area : u.s.t. , u.e. / malabon. Hope you could feature them too!! as it is the latest craze amongst students as it goes buy one take one! hope to catch them here!! !